MAYNARD, MA: As 2018 draws to a close, there is a sense that this has been a rainy year, with a delayed start to winter weather. True or not? Trend or not? True. Using Boston weather data, through November 7th there has already been 44 inches of precipitation for the year. That figure counts rain and melted snow. The yearly average is 43.8 inches, so the average was exceeded with nearly two months to go. Closing out the year, long-term data predicted an additional 6.8 inches of precipitation by the end of December. However, by the time you read this, Maynard may have already gotten an additional 2-3 inches of rain, and perhaps a bit of snow. And right now, the extended Thanksgiving weekend is looking to be wet. For those who cannot remember what the whole year was like, March and April were well above average, May through July was drought, then August through now have been well above average. UPDATE: Through morning of December 30th, Boston reports 52.9 inches of precipitation. Locally, the 2018-2019 winter has had five inches of snow. season, but because plants take up so much water, the river is low. This is in stark contrast to the extended drought that had persisted from 2012 through 2017. As for long-term trends – wetter. Massachusetts records dating to before 1900 show that average annual precipitation was in range of 35 to 40 inches gradually but consistently increasing to 45 to 50 inches. There are always exceptional years. Those with long memories can tell about the severe drought of 1964-66. More recently, the flood year of 2010, with 15 inches of rain over late February into mid-March, pushed the year’s total to almost 65 inches. Going forward, it will be interesting to see if 2019 and beyond stay above the long-term average or revert to the recent drought years. Keep in mind that Maynard draws roughly 900,000 gallons per day from its well fields, discharging a similar amount into the Assabet River as processed wastewater, so is extremely important that our aquifers be recharged by adequate rainfall and snowmelt. snow storm. Click on photos to enlarge. One not surprising consequence of the trend for wetter years had been more water in the Assabet River. Record keeping by the U.S. Geological Survey dates back to 1942, and shows that river water volume has increased from 160 to 225 cubic feet per second (cfs). As of this column being submitted on November 9th the river was at 709 cfs. This compared to an average of 90 cfs for mid-November. (A cubic foot equates to 7.48 gallons, so 709 cfs equals 19.1 million gallons per hour.) 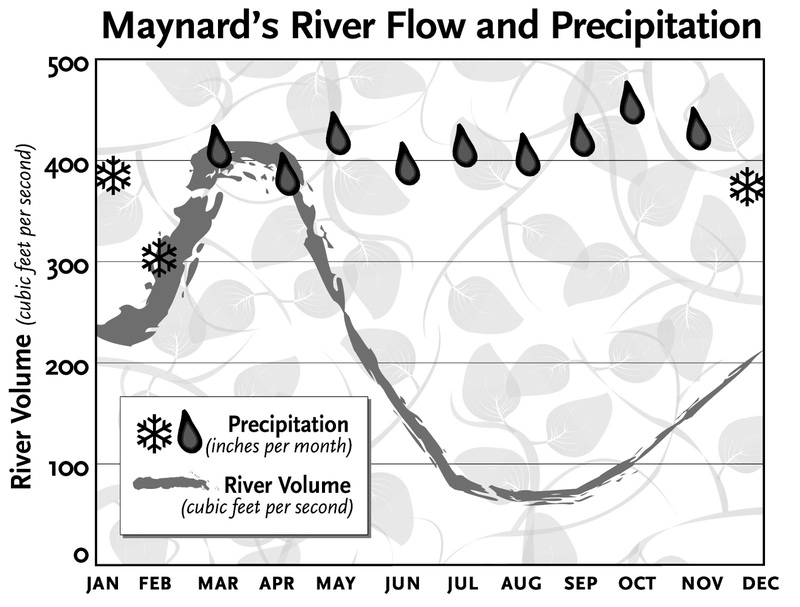 Rainwater and snowmelt run off far, far exceed Maynard's water needs, but the town has no reservoir to retain the surplus water. As for freezing temperatures and the white stuff, this year has been warmer than average. From pre-1900 to present the Massachusetts average annual temperature has gone up one degree – from 47.3 to 48.3. Even modest increases in temperature have consequences. Winter has become shorter. One indication is that peak lilac blooming time has shifted from late to early May. Warm air can hold a higher water content than cold air, so storms tend to be more intense, meaning wetter and also windier. Think back to March, when a series of tree-toppling storms crashed our area. Some of the woodland trails still have tree blockages that were too massive for volunteers to manage. Long-term averages are less than one inch of snow in November, and 12 inches for December. That’s for Boston. The snowier Worcester expects 18 inches in December. Us, being midway between, might expect 15 inches of snow before the end of 2018. One surprising consequence of warmer and wetter, is that while winter has been becoming shorter, it is also wetter, packing more snow into a shorter season. The winter of 2010-11 set an all-time record, and for Boston, of the ten snowiest winters dating back to 1890, five has been in the last 20 years. This is a good time to make sure the snowblower is winter-ready.